Introducing 315 Broadway- A 2018 built 46-unit luxury apartment development in the heart of Winter Hill, Somerville. Units offer attractive light filled open floor plans, 9 ft ceilings... terrific kitchen layouts w/ SS appliances, granite counter-tops and LED lighting..w/d hook-ups, large closets... Amenities include direct elevator to heated parking garage, common laundry, pet friendly environment with mix of onsite retail. Situated at the corner of Broadway & Temple, this location offers a trendy neighborhood with its own special vibe and great access into Boston. 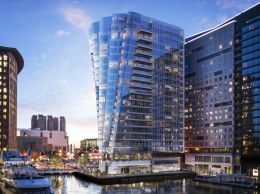 Convenient to Davis Sq, Ball Sq & Union Sq and approximately 1 mile to Assembly Row. Ask about our limited time Move-In Specials.